Posted By:Unknown | At:7:55 AM Be the first to comment! In your face Vivienne Westwood! Evidently the acclaimed fashion designer doesn't speak for all Brits when it comes to her criticism of Michelle Obama's fashion taste. Michelle Obama has been crowned fashion royalty by Britain’s Sunday Times Style Magazine, which ranked the first lady at the top of its best-dressed list. 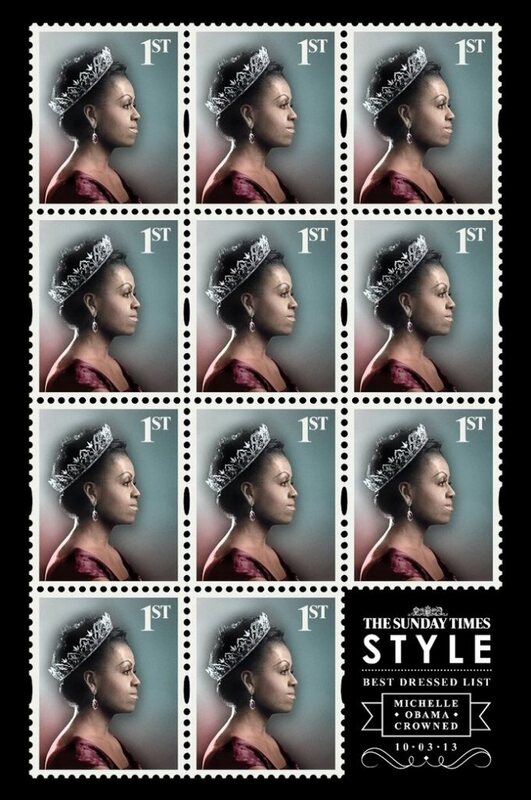 To promote the issue, the magazine released an ad featuring a profile of Mrs. Obama wearing a crown on a British first-class postage stamp, a spot traditionally reserved for the Queen of England. Man, I wish these were some real stamps because I would definitely buy some as a collector's item.